Marathon day in Boston always inspires fun and interesting promotions. This year footwear and apparel maker Puma is promoting a cause marketing promotion that benefits Soles4Souls, a nonprofit that provides shoes to poor people around the globe. Throughout marathon weekend runners have been putting in miles on the treadmill at PUMA's 333 Newbury Street location. 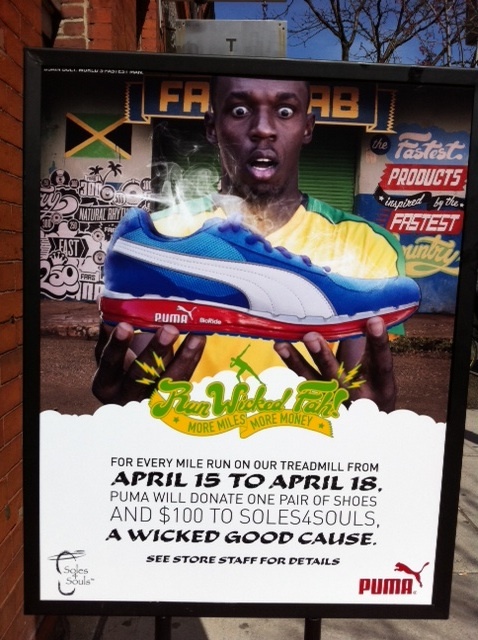 For each mile recorded on the in-store treadmill PUMA will donate $100 and a pair of shoes to Soles4Souls. This promotion runs right through marathon Monday so lace up your shoes and head to Newbury Street! What's great about this cause marketing promotion is that anyone can do it. You needn't be a big international footwear company like PUMA. It's a simple action-triggered donation program that could be executed by any business that wants to help a good cause by having a run for good on a treadmill. Sure, a store that sells running footwear and clothes is perfect for this promotion. But the idea could work at a bank, health club, the lobby of a skyscraper or where gym equipment is sold. Just because the elite runners set the pace doesn't mean you can't trod the same course. The hospital has its own marathon day promotion. We recently partnered with LevelUp, a Google-funded company, which has launched the first local deal site that drives loyalty and brings in new customers who keep coming back again and again. Today's deal is at Laced, a sneaker boutique in the South End. For anyone that buys the 1st Level/deal at Laced over the next 7 days, BMC will receive 25% of the proceeds. The LevelUp Street team is promoting this opportunity all day along the marathon route with our very own Ashley Zolenski who will be decorated in LevelUp tattoos on each arm (shhhh...we're not sure they're temporary tattoos). If you're out on the marathon course today be sure to watch for Ashley "LevelUp" Zolenski!